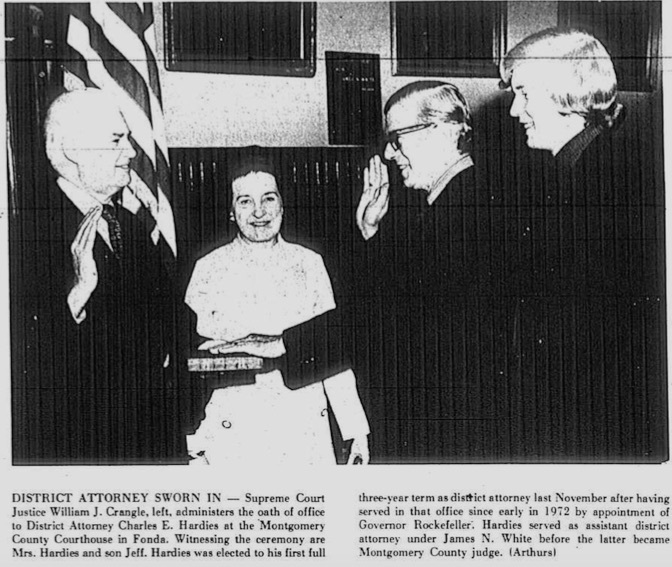 In January of 1972, sixty-five years after his father was sworn into the same exact office, Charles E. Hardies stood with his wife and only son in front of Supreme Court Justice William Crangle and took the oath himself to become Montgomery County District Attorney. Born on August 30, 1911, Hardies had just been appointed to that post by then Governor of New York State, Nelson Rockefeller to fill the unexpired term of Jim White, who had himself just been appointed Montgomery County Court Judge by the Governor. His dad, Charles E. Hardies Sr. had been a revered figure in this area’s legal community right up until he died suddenly on December 22, 1939 at his 19 Grant Avenue home in Amsterdam, NY, after being stricken with a heart attack. He had served as both DA and Montgomery County Court Judge during the four decades he had been a member of the County bar. Many expected his son to follow the same career path when today’s Amsterdam Birthday Celebrant went on to win reelection twice to consecutive three-year terms as DA. But those terms coincided with an ongoing probe by the New York State Investigation Committee looking into allegations that members of the Amsterdam Police Force and its Chief were accepting kickbacks and bribes for everything from steering business to City tow truck operators who paid for the referrals, to permitting illegal gambling activities to flourish in Amsterdam, unfettered by law enforcement. You can read the rest of my story about this former DA in my new book “A Year’s Worth of Amsterdam Birthdays.” To order your copy, click here.